The authorities in Uganda have charged a British theatre producer, David Cecil, for staging a play about the condition of gay people in the country. 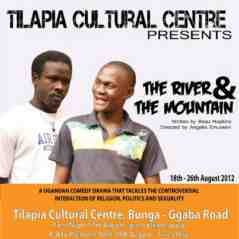 He appeared in court accused of disobeying lawful orders , because the play The River and the Mountain by Beau Hopkins was performed without authorisation. Cecil was denied bail. The play, with the main character being a gay businessman killed by his own employees, was performed at two theatres in the Ugandan capital, Kampala, last month. Only days before the play was set to open in August, Cecil received a letter from the country's Media Council, the body tasked with regulation of media. It stated the play was to be suspended pending an official content review. Cecil and his company, under legal advice, interpreted this as a request rather than an order. Initially, the play was to run at the National Theatre, open to the general public but Cecil decided to move the production to private venues and eight performances were seen by an invited audience. Cecil was arrested after the short run, and branded a gay rights activist by an angry media. Cecil's second hearing is taking place tomorrow. There, it will be decided if the prosecution have enough evidence to take the case to court. Cecil's legal team will argue that there were no references to any parts of the constitution or penal code in the letter from the Media Council. It did not refer to any legal consequences if they should choose to perform the play. Furthermore, Cecil says the Media Council is supposed to be an advisory body, it holds no executive authority over individuals' rights to express themselves. A petition calling for the charges against Cecil to be dropped has been signed by more than 2,500 people, including Mike Leigh, Stephen Fry, Sandi Toksvig and Simon Callow. The petition was organised by Index on Censorship and David Lan, the artistic director of the Young Vic. Gay rights campaigners in Uganda and around the world are celebrating a decision by the country's constitutional court to strike down a widely condemned anti-gay law on a legal technicality. Activists in the courtroom cheered after a panel of five judges ruled that the speaker of parliament acted illegally when she allowed a vote on the measure despite at least three objections that not enough MPs were in attendance. While celebrating the ruling, activists warned that homosexuality remained a criminal offence in the east African country under colonial-era laws.